Germany: 18/05/12 – Latest on Capt. Watson – German Prosecutor’s Late Motion Gives German Ministers More Time to Free Captain Paul Watson! In an extraordinary move by the German Higher Regional Court in Frankfurt, the court has granted the general public prosecutor’s request for Captain Paul Watson’s preliminary arrest for extradition to Costa Rica. However, the court has also granted bail for Captain Paul Watson during the time the court considers whatever documentation Costa Rica is able to provide to substantiate their bogus allegations against Captain Paul Watson. 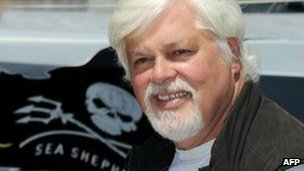 It is expected that Captain Paul Watson will be freed on bail on Monday, May 21, 2012. Sea Shepherd’s legal team says this is an unusual, but promising move on the part of the Higher Regional Court and is further indication that the international campaigning efforts for Captain Paul Watson’s release are being heard in the chambers of justice in Germany. In a press release, received towards the end of business hours Friday, the Higher Regional Court stated that “the question of whether or not Mr. Paul Watson will be extradited is not ultimately a decision by the Higher Regional Court but by the executive body which is the Ministry of Justice”. Even the Higher Regional Court is stating that the Ministry of Justice in Germany can step in and prevent his extradition at any time. The international campaign to save Captain Paul Watson from a politically-motivated extradition to Costa Rica where he will not receive a fair trial, nor is it likely that he would even survive jail to see the inside of a courtroom, is having an effect. The Taiwanese shark fin mafia in Costa Rica has made threats on Captain Paul Watson’s life. First the general public prosecutor stated in his motion to the Higher Regional Court, that the Ministry of Justice and the Ministry of Foreign Affairs have the power to stop the extradition process for political reasons. Now, the Higher Regional Court in Frankfurt is also deferring to the Ministry of Justice. Sea Shepherd calls on its supporters in Germany and overseas to continue writing Federal Minister of Justice Sabine Leutheusser-Schnarrenberger and Minister of Foreign Affairs Dr. Guido Westerwelle and expressing their concern about a politically-motivated extradition that would be the same as a death sentence. Sea Shepherd is planning a global day of action on Wednesday May 23, to coincide with a diplomatic visit to Germany by Costa Rican president Laura Chinchilla Miranda. Please ring, e mail, etc, until Capt. Watson is free. Contact details below – Thanks – SAV. German Prosecutor’s Late Motion Gives German Ministers More Time to Free Captain Paul Watson! 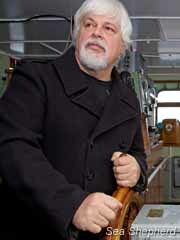 Captain Paul Watson at the helm of the Sea Shepherd flagship, the Steve Irwin. Photo: Barbara VeigaSea Shepherd expected news on the fate of Captain Paul Watson to be announced yesterday by the German Higher Regional Court in Frankfurt but as hours passed on, no word was received from the general public prosecutor until close of business hours. At 1800 hrs, the general public prosecutor finally submitted his motion for a preliminary extradition arrest warrant against Captain Paul Watson. The late filing of this motion, coupled with a German bank holiday today, has given Captain Paul Watson’s supporters and allies until this Friday to appeal to German Federal Minister of Justice Sabine Leutheusser-Schnarrenberger and Minister of Foreign Affairs Dr. Guido Westerwelle’s standards for International Human Rights. Thus the keys to Captain Paul Watson’s freedom are in the hands of the Honorable Minister of Justice and the Honorable Minister of Foreign Affairs. We therefore ask all supporters of Captain Paul Watson to immediately contact the Minister of Justice and the Minister of Foreign Affairs to ask them to end the unjust and politically-motivated extradition of Captain Paul Watson before a panel of judges decides Captain Paul Watson’s fate on Friday. For days, Sea Shepherd supporters from Germany and around the world have expressed their concerns about the political nature of this extradition, as well as their concern for the safety of Captain Paul Watson, to Federal Minister of Justice Sabine Leutheusser-Schnarrenberger. Given the motion made by the general public prosecutor, it is now time to also focus attention on Minster of Foreign Affairs, Dr. Guido Westerwelle. Either Minister (or both Ministers) can take the action that Interpol has already taken and acknowledge that the case against Captain Paul Watson is politically-motivated and is a violation of Captain Paul Watson’s human rights. Should the Honorable Ministers fail to put the brakes on the persecution of Captain Paul Watson, the extradition process will proceed and Costa Rica will have a maximum of 90 days, from the time that he was arrested, to put forward their bogus case for extradition. During this time, Captain Paul Watson would remain isolated in prison, awaiting an extradition that would be tantamount to a death sentence. This is our final effort to ask the Honorable Ministers to intervene before the extradition process officially begins. We only have hours to change the minds of the German officials who can make a difference and not only save the life of Captain Paul Watson, but also save the lives of whales, dolphins, seals, and fish that he has spent his life courageously defending. While visiting Captain Paul Watson in prison, Ship Operations Officer, Peter Hammarstedt and Director of Intelligence and Investigations, Scott West were able to obtain a handwritten note from Captain Paul Watson to his supporters, which you can read at the bottom of this article.